The incredibly well padded Black Diamond Mondo Crash Pad has become one of the most popular choices for protecting those tall and scary highball boulder problems and just recently one a Best in Gear Award. I know if you are like me you can sometimes get pretty sketched out as you are cranking through that crux move at 20 feet. Well let me tell you that you have nothing to worry about with the Black Diamond Mondo Crash Pad with One solid inch of closed-cell foam that caps four inches of open-cell foam. This gives you a nice and juicy five inch thick landing zone that is pretty much impossible bottom out through. However, you are crazy like some of us are and decide to solo up say 60 feet you will probably bottom out, but just stack a few pads and maybe a spotter and you are set. The mondo pad gives you a ton of surface area (44in x 66in). This can give you a big target when you get sketched and drop off a highball like I do a lot. Let’s be honest though most of the time you’ll have a few pads and what I like to do is stack them for a drop off. This taco folding pad has a flat-hinged design which makes the Mondo a lot easier to fold shut and easier to carry to your sweet climbing spot. Kinda hard to believe but this fatty actually fits in the backseat of most cars. Aluminum buckles, reinforced corners, and double-stitched seams add years to the life of a pad that’s meant to get a beat down and I know you like to beat the hell out of your bouldering crash pads. Hell this bad boy even has a 1 year warranty so if you beat the hell out of it too much they might just hook you up. 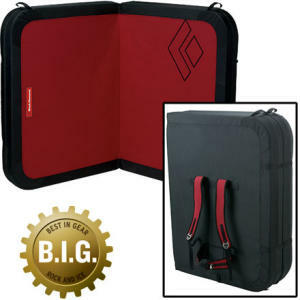 Bottom Line: Black Diamond Mondo Crash Pad is a necessity for highball boulder routes and is badass so pick it up today. This entry was posted on Tuesday, August 17th, 2010 at and is filed under Climbing Gear, Climbing Gear Reviews. You can follow any responses to this entry through the RSS 2.0 feed. You can leave a response, or trackback from your own site.